Code's Combat Alerts provides notifications and alerts for a selection of PvE mechanics. There are not many configuration options for this addon. You can type the /cca command into chat to see a list of available options and commands. /cca move – This will cause the status display—which is used by some features such as timers—to appear for 20 seconds so that it can be repositioned outside of combat. To reposition, simply drag it around with your mouse. The status display can also be repositioned when it appears in actual use. Although the visual cue for this mechanic is glaringly obvious and difficult to miss, the cue is designed to aid in the interrupt of Taking Aim. If the enemy could not be interrupted, timing a dodge roll is difficult because the ability has an extremely long windup of 9 seconds (5s in Halls), and the secondary visual cue—the enemy lowering their bow to aim and the intensification of the orange glow—still happens far too long before the actual cast, which means that dodge rolls based on that secondary visual cue would still happen too early. This addon will sound an audible alert to signal the need to dodge 1.6s before the actual cast, and players should time their dodge on that cue. If the enemy is interrupted or killed before the 1.6s remaining mark, there will be no alert of any sort; i.e., there is no alert of the start of a Taking Aim cast. Most Taking Aims are interrupted, so there is no point in adding unnecessary noise; the alert is sounded only in those exceptional cases where an interrupt still had not happened with only 1.6s remaining. This addon will sound an audible alert to signal the need to dodge specific mechanics. Most dodgeable attacks will not generate an alert. The goal of this addon is to fill the gaps in specific cases where the game's visual cues are insufficient or difficult to use. Things like Nerien'eth's and Voriak's "skull attacks" in Crypt of Hearts II and Maelstrom or Skoria's fireball in City of Ash II all have good, well-designed visual cues, and I see little reason to have alerts for them. You can drag this status display around with your mouse to reposition it. This tracks all players who have the debuff and the degree of each of those player's debuff, so a main tank can see when their tanking partner has been hit with two smashes. You can drag this timer around with your mouse to reposition it. This timer counts down to when the senche initially fears its victim, which is the point at which the victim loses control of their character. The actual interruptible Death Grip mechanic follows about a second later. Additionally, at the start of the initial fear, an alert will be displayed that identifies the victim. If the Baneful Burst is preempted by a Roaring Flare, the timer will indicate that the mechanic is awaiting the completion of the Flare; Z'Maja will start to cast Baneful Burst within 1s or less after the Flare completes. Mechanics found in trials are generally covered by Raid Notifier and other trial-specific addons. Note: This addon is a continuation of and replaces the Perfect Roll addon. It is recommended that you uninstall the old Perfect Roll addon if you still have it installed. coming across some issues here. died many times because when the addon dings to notify me of taking aim, the arrow is already in the air halfway to my character simply no time to dodge. That sounds like a lag issue. 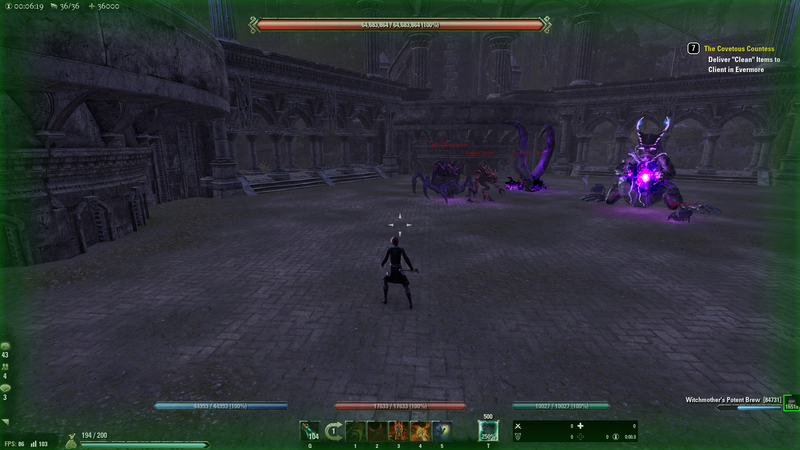 also, plain and simply not notifying me of the poison in the vault of umbrage in vma. granted that hasnt caused me any deaths yet, its disorienting when, 30 seconds later, the addon finally gets around to notifying me of the poison. after ive already cleansed it. leading to a very confused me. CCA does not alert poison. That's Raid Notifier. I was just looking to inquire that your addon will also notify the tanks of shattered armor when applied by Dromathra savages as well as the first boss & not just the hulk? Raid Notifier already handles those mechanics. I personally think that the visual cues are quite ample. The boss has the heavy attack telegraph, and there is a very hard to miss circle at your feet that specifically helps you time the dodge roll. Even when the boss unexpectedly targets me with that ability (like when the tank goes down), I've never found it difficult to notice and react. Because I feel that the existing cues are sufficient (and the timing is quite generous), I have no plans to add this. Also would you consider adding Falkreath Hold Last Boss heavy attack audio Q aswell ? I'll add that at to some future version. The heavy attack animation is more subtle and hard to see when there are a lot of adds obstructing your view. I'll make sure the notification is suppressed if the victim is already blocking. Also if it's in any way possible , I think the heavy attack of the boss shadow during hunt phase in MoS would be great to have. I have been caught many times because when I am walking toward the traps they attack me from behind and it's a one shot...Having a sound to dodge these would be quite useful. Last edited by hydroseven : 08/23/18 at 06:33 AM. Another request can you fix the Alerts showing ^f ^m ^ns etc behind the text? Hmm, thanks for that report. Almost all of the text used in the alerts come from the game itself. E.g., the addon doesn't say "Electric Water", it instead asks the game what the name of the electric water ability is, and then displays that name. This is so that the names are localized, if there are localized versions of those names for other languages. Apparently, according to your screenshot, ZOS added gender-identification tags to these names ("^f" means female and "^n" means neutral, for example) in the non-English versions of the game. This is a bit surprising since these tags aren't found in the English version (and I didn't know that we cared about the gender of electric water). I'll make sure these tags are filtered out in a future version. Last edited by code65536 : 08/22/18 at 08:15 AM. I want to limit the scope of this addon and avoid unnecessary noise. Thus, my criteria to adding dodge notifications are that (1) the in-game tell for that ability is difficult to see/hear and that (2) the ability is one of consequence (e.g., something that can 1-shot you). Both criteria must be met before I consider adding it to the addon. Glancing over the list from Bandits, the vast majority are things that do not meet this criteria. If there are specific abilities that you think meet this criteria, I'll consider them on a case-by-case basis. Yah there are lots of them in the list that meet your criteria, hard to filter them out now... For the ones that don't maybe you coud create its own category and add ingame options that are disable by default so that you can choose what things you want to see. Or maybe you coud make ingame options where I can create and save my own timers to hide/add specific alerts with a white/blacklist. Last edited by code65536 : 08/21/18 at 09:58 PM. Love this addon but I use Bandits UI and it has a lot more alerts, I want to tell ppl to get this addon so they don't have to use a whole UI for alerts, so maybe coud you add the IDs I edited over from Bandits? Note that this are all spell that are not in raid notifier and most of them have a more specific timer then "long" and "short" so maybe you have to adjust this in your addon. Great addon , Very useful in Fang Lair !! A countdown might work better for Clash of Bones. "Dodge Roll in 3... 2... 1..."
The addon's dodge roll alerts will sound the dodge notification 1.6 seconds before the attack lands, which is early enough for the player to react, but not so early that the attack lands after the player's dodge immunity has worn off. Clash of Bones has a windup time of 2.25 seconds. The addon is basically waiting 0.65s before alerting you. A countdown makes no sense here. Ok. I had two hit me within a about a 2 second window at the end, and I was just thinking of possible ways the addon could have helped me to survive it. Nice addon btw, thanks for making it. Thanks for the addon. The VMA final boss skulls are not registering. However, Quick shot, and the lightning ball from the wamasu work fine. This is intended. I did not include the final boss's skull attack because it's already well-telegraphed and easy to dodge. When you see the blue swirls around your body, he's about to fire it off and you can dodge it; you don't even need to have your eyes on the boss. In contrast, the Wamasu's attack is notified because the tell on it is more ambiguous and sometimes not visible (particularly when it initially spawns and is rendered halfway below the ground), and the Taking Aim is notified because the timing is difficult to judge visually and is very easy to dodge too early. Thanks. Would be nice to have an option for the final boss skulls both upstairs and down because often you are not facing the boss. As I just noted, you don't need to even look at the boss. There is already an in-game notification that the projectile is coming, in the form of the blue swirls around your body that grow in intensity. How hard is it to add? I might try to add the notify to the LUA code myself. It would make it a lot easier for vma. Most of the time with the lag the effects don't even show up anyway. Last edited by MK32 : 08/04/18 at 08:31 PM.